Pearls here, pearls there, pearls everywhere. Cultured pearls, natural pearls; freshwater pearls, saltwater pearls. Pearls are popular. But all the quantity can make it difficult to determine the quality. Depending on how you are planning to use your pearls, you are going to want the highest quality for your dollar. Luster is the most important and the easiest way to determine the quality of a pearl. What is luster? It’s the shine or glow of the reflection of light diffusing through layers of nacre as it hits the pearl. High luster tends to make a pearl more valuable. Good quality pearls should have a bright reflective luster, not dull. When you look at the pearl, the clearer the image the better. If you have a mirrored image, you know the pearl is of high quality — and not just because of your pretty reflection. This is another easy way to figure pearl quality. The highest-quality pearls will have an immaculate surface free of scratches, spots and imperfections. Note that it is nearly impossible to find a pearl with zero imperfections. As the pearl grows, the oyster will naturally leave some type of mark on the pearl so tiny irregularities are acceptable and often helpful as a test of authenticity. The number of imperfections — such as scratches, cracks and spots — determines value. The less marks on the pearl the higher the value. Pearls are stereotypically round. How round? Well, that matters! The more round the pearl the higher the quality it is. Perfectly round natural pearls are the rarest. The color of a pearl is important, but not as much as the above characteristics when it comes to quality. Pearls come in just about every color from white to green, blue, black and gray. The rarest color found in cultured pearls is the gold of the golden South Sea Pearl. Color is more of a matter of personal preference. nacre is the substance pearls are made of. it is the crystalline substance secreted by an oyster or mollusk that builds up around a small bead or piece of mantle tissue that has been implanted dusing the cultivation process. The thicker the nacre, generally the more durable the pearl. 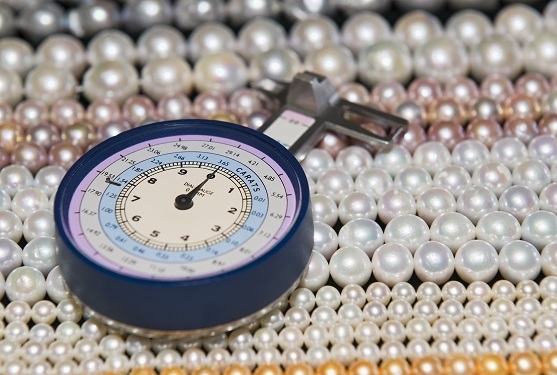 A pearls is measured across its diameter, and a natural pearl typically ranges from 1.8 to 6 millimeters while a cultured pearl ranges from 3 to 18 (whoa!) millimeters. The size of a pearl depends on several factors such as the species of the mollusk or oyster, cultivation time periods, and the size of the nucleus. Using size to determine the value of a pearl can be difficult. Usually, all other value factors being equal, the larger pearls are the rarer and more valuable; however, there are times when a small pearl can be as valuable. Similarly a large pearl can have many imperfections and be of low quality. So, if you have looked all characteristics to determine the quality of a pearl, note the size. If all other characteristics line up, the size of the pearl may determine its value. Each pearl is unique. In order to create jewelry or strand of pearls, pearls that complement or match each other are selected in a process that can take years. Thousands of pearls must be sorted and evalauted to find the desired combination. When results are achieved, the necklace is determined to be an ideal blend as a whole strand. In other words, it has coherence and balance. The pearls match.